Currently viewing the category: "Near Earth Asteroids"
NEO NEWS (24 SEP 2015) Nuking NEAs, NEA Mining, Honors to Consolmagno and Durda. By Mark Strauss, Aug 3 2015. NEO News (now in its twentieth year of distribution) is an informal compilation of news and opinion dealing with Near Earth Objects (NEOs) and their impacts. 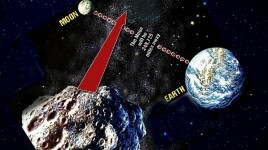 NEO News is a newsletter about near earth asteroids and related topics. 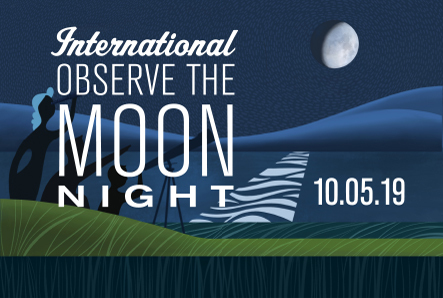 The opinions here are those of the author, David Morrison, and do not represent NASA or any other organization. You may quote or use these comments as long as you note the original source. Watch this video of a proposed mission to capture a small near-Earth asteroid for astronauts to visit and explore. The Sentinel mission is designed to give humanity sufficient warning time to be able to prevent threatening asteroid impacts. A hearing in the House of Representatives on Threats from Space: A Review of U.S. Government Efforts to Track and Mitigate Asteroids and Meteors, Part 1. Studying meteorites from the giant asteroid Vesta helps understanding of the "Lunar Cataclysm." David Morrison is chief organizer of the special Chelyabinsk session, which is open to the public, on 4/14/13 at the High Country Conference Center in Flagstaff, AZ. NASA Television will provide commentary at 2 p.m. EST (11 a.m. PST) on Friday, Feb. 15, during the close, but safe, flyby of asteroid 2012 DA14. 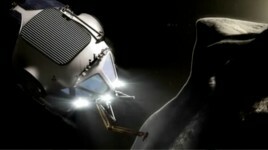 NASA's Dawn spacecraft has revealed that the giant asteroid Vesta has its own version of ring around the collar. The competition is open to students under age 18 from anywhere in the world. The contest deadline is Sunday, Dec. 2, 2012. Neil deGrasse Tyson and NEEMO (NASA Extreme Environment Mission Operations) explore what it takes to stop an asteroid from colliding with earth. 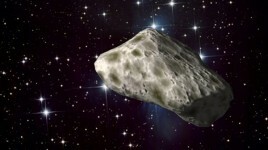 Wach a time-lapse video of near-Earth Asteroid 2002 AM31 on July 22nd 2012 from Slooh's Canary Islands observatory. The team used new analytical techniques to chemically and mineralogically map large volumes of Apollo regolith breccias to detect these never-before seen relics. Asteroid collision that spawned Vesta's asteroid family occurred more recently than originally thought. Update: Listen to NLSI Director Yvonne Pendleton talk with Overnight America's Jon Grayson about this exciting research. A massive asteroid, whose impact left a 1,200-mile-wide crater, may explain why parts of the moon's surface have a magnetic field but others don't. Scientists working with NASA’s Dawn spacecraft have created a new video showing the giant asteroid Vesta as the spacecraft approaches this unexplored world in the main asteroid belt. The asteroid appears as a small, bright pearl against a background of stars. This first image hints of detailed portraits to come from Dawn’s upcoming visit. A 10-meter wide asteroid is set to pass between the earth and moon on June 2, but scientists say it is of no threat to Earth. 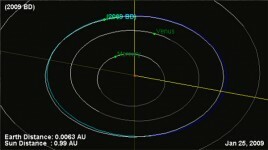 Asteroid 2009 BD, which was first observed on January 16, 2009, will pass within 0.9 lunar distances (the distance between Earth and the Moon) of Earth. Astronomers believe the rock is a rare “co-orbital asteroid” which follows the orbit of the Earth, not receding more than 0.1 AU (15 million km) away. 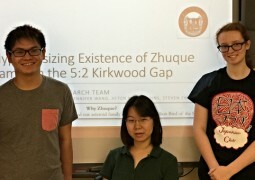 Houston-Area Student Space Researchers to Present Findings at NASA Ames. The last human visitor left the Moon in December 1972.